For many reasons, a patient sometimes loses teeth in one arch or both arches, upper and lower. Sometimes the patient becomes hopeless, and they would like them to have their teeth replaced to get a new smile and also to function better. There are different options for replacing teeth (a full arch) and can go from a removable solution to a fixed one. The new exciting procedure that has been going on for a while is what we call “All on four.”. Basically, it's a fixed bridge fixed to four implants. In some cases, we can provide that service all in one day, but there's a lot of planning involved before and after that day. It begins with a consultation. The patient and I will see what the best option for them is. If we decide that this is, the patient needs to go to see an experienced and qualified oral surgeon. The patient will get a CT scan where they will evaluate the bone and determine whether it is a candidate to get an all on four. Once that is determined, we can start with the process of fabricating the hybrid bridge that's going to be connected to the all on four implants. This process takes about four to six weeks. There is a one-day appointment where the implants are placed in the morning by the oral surgeon and in the afternoon where I fit the hybrid bridge over the four implants. This bridge is highly functional over the four implants, making it possible for the patient can enjoy a steak or eat an apple the same day. 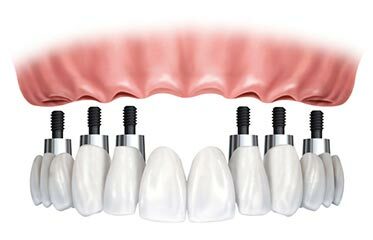 If you have ill-fitting denture or hopeless teeth than ALL-on-4 dental implant procedure will provide you with a new set of permanent replacement teeth. The new teeth will be fixed to as little as 4 implants placed strategically in the jaw to provide secure and stable support. You can eat with confidence of natural teeth. With proper planning, on the day of implant placement you will get a new set of teeth. All this can be done while you are sedated. Increase chewing ability. You will be able to bite into an apple and chew as if you have natural healthy teeth. 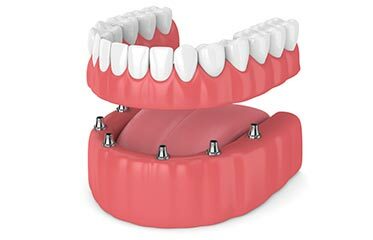 Eliminates frustration of bulky removable dentures. No more glue. Restores a youthful appearance and fills out facial contours. In most cases reduces wrinkles. The angled back dental implants avoid sensitive area. 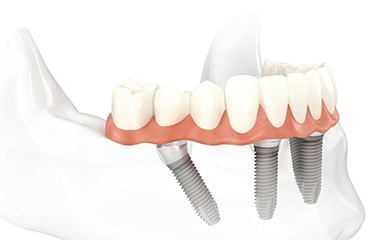 The dental implants have more surface area contact with bone resulting in a more stable new teeth. 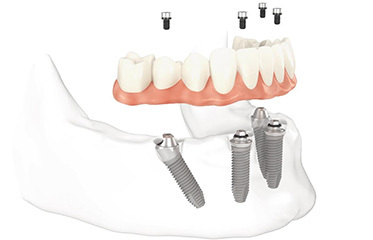 Angled back dental implants avoid the needs for bone grafts reducing cost and recovery time. Missing teeth? Don’t let them be an excuse to hide your smile!